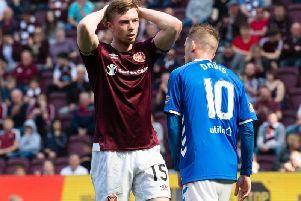 Ann Budge admits Hearts fans are responsible for Tynecastle’s new stand becoming a reality – and urged them to continue backing their team in every way. The club owner today explained why it’s vital supporters continue pledging to Foundation of Hearts, buying merchandise and attending matches in their thousands. City of Edinburgh Council last week approved planning permission for Hearts’ new £12million main stand, and Budge stressed that supporters will be the main beneficiaries. “It does matter, we absolutely have to keep their support because they’re the ones that spend money at the club,” she said. “They’re the ones that will help us benefit from the additional facilities that we’re going to have, by using them. It’s crucial. “We have a commitment from the Foundation of Hearts pledgers, it’s crucial that that commitment is realised and I’ve no reason to think for a minute that it won’t be. “It’s equally crucial that the supporters continue to buy the strips, come to hospitality, buy their season tickets – all of these things.